When you see gutters along streets, it is clear whether or not they are doing their job. These gutters collect water, clutter and debris at the street level. The ones along your roof operate the same way but are less visible. Your gutters take the water that falls onto your roof, and carries it to a more aqua-friendly area. For something so important, your drainage system does not get a lot of attention but our Vaughan eavestrough cleaning can change that. However, when your gutters block up, there is no drainage to be had. 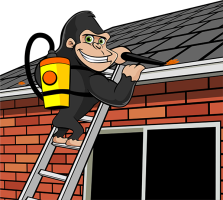 Instead of letting your system fill up, call our Gorillas for your Vaughan gutter cleaning service. There can be a lot of stress associated with getting up to eye-level with your gutter system. Instead of just turning a focused eye to the exterior of your property, your Vaughan gutter cleaning requires you to either get tall quickly or get to climbing. Not all humans can be great in this department but our Gorillas are in a league of their own. If you have considered grabbing a ladder and heading upward, there are a few things to consider first: 1) it is easy to fall! 2) you might damage the gutters themselves. and 3) a proper Vaughan eavestrough cleaning is hard to achieve. The good news? Our Gorillas eliminate all of these issues for you! Instead of going up against your gutters all on your own, let us help. Gorilla technicians are light on their feet, always concerned with safety and produce expert results every time. One of the most important things to know about your gutters is that anything left behind in the system multiplies and it does so quickly. Something as small as a stick can catch onto other debris like leaves or dirt and before you know it – you are overrun with softened materials and water stains. In order to prevent this from happening, our Gorillas use top of the line tools to get your gutters looking squeaky clean. By using ‘before and after’ photos, you will never have to wonder how your Vaughan gutter cleaning turned out.